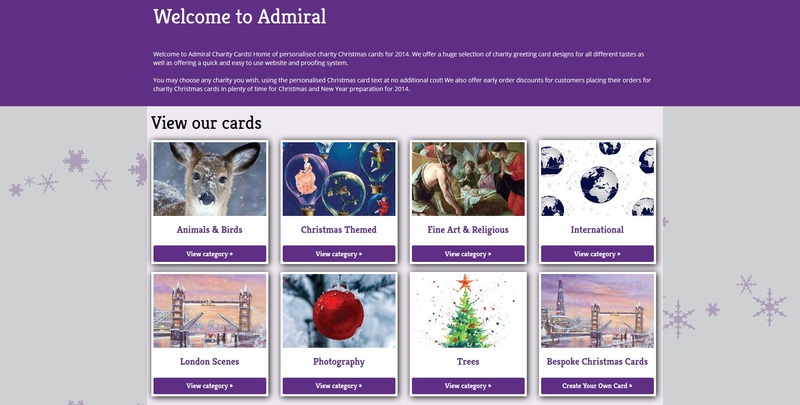 Home > Blog > Welcome to the new Admiral Charity Cards website - designed with you in mind! When choosing a Christmas card, it’s important to have a selection of styles and designs. The website gallery displays categories to meet all tastes, so you can review your preferences and make your choice. With easy online proofing, registration & checkout, you can place your order in just a few minutes with total confidence. Creating your own personal message at Christmas time is always something special. And remember 12% of your order value goes to the charity of your choice. If you need any help or guidance, just call our team on 020 7610 6193 during normal office hours Monday to Friday. With a great range, early order discounts & free sample service, there is everything to meet your needs. So, thank your customers in style this Christmas or send that unique, personal greeting to all your contacts. And tell us what you think – we always listen to feedback to improve our products & service.